A system or subsystem as it exists within the corporate organization may be graphically depicted in several ways. The various graphical models show the boundaries of the system and the information used in the system. The first model is the context-level data flow diagram (also called an environmental model). Data flow diagrams focus on the data flowing into and out of the system and the processing of the data. These basic components of every computer program can be described in detail and used to analyze the system for accuracy and completeness. As shown in table below, the context-level data flow diagram employs only three symbols: (1) a rectangle with rounded corners, (2) a square with two shaded edges, and (3) an arrow. Processes transform incoming data into outgoing information, and the content level has only one process, representing the entire system. The external entity represents any entity that supplies or receives information from the system but is not a part of the system. This entity may be a person, a group of people, a corporate position or department, or other systems. The lines that connect the external entities to the process are called data flows, and they represent data. An example of a context-level data flow diagram is shown in the figure below the table. 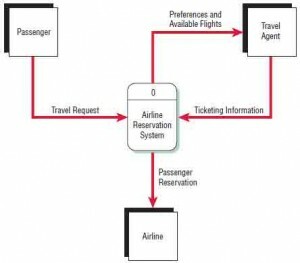 In this example, the most basic elements of an airline reservation system are represented. The passenger (an entity) initiates a travel request (data flow). The context-level diagram doesn’t show enough detail to indicate exactly what happens (it isn’t supposed to), but we can see that the passenger’s preferences and the available flights are sent to the travel agent, who sends ticketing information back to the process.We can also see that the passenger reservation is sent to the airline. The context-level data flow diagram serves as a good starting point for drawing the use case diagram (discussed later in this chapter). The basic symbols of a data flow diagram. A process means that some action or group of actions take place. An entity is a person, group, department, or any system that either receives or originates information or data. A data flow shows that information is being passed from or to a process. 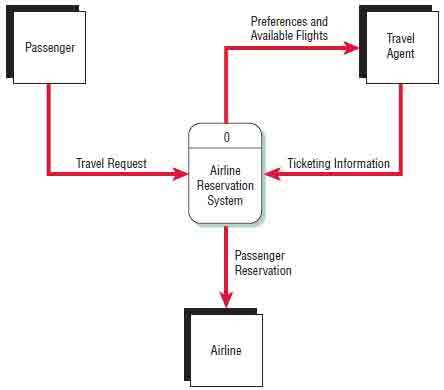 A context-level data flow diagram for an airline reservation system. In Chapter 7 we see that a data flow contains much information. For example, the passenger reservation contains the passenger’s name, airline, flight number(s), date(s) of travel, price, seating preference, and so on. For now, however, we are concerned mainly with how a context level defines the boundaries of the system. In the preceding example, only reservations are part of the process. Other decisions that the airline would make (for example, purchasing airplanes, changing schedules, pricing) are not part of this system. The context-level data flow diagram is one way to show the scope of the system, or what is to be included in the system. The external entities are outside of the scope and something over which the system has no control.